This is “Presenting Data with Charts”, chapter 4 from the book Using Microsoft Excel (v. 1.1). For details on it (including licensing), click here. 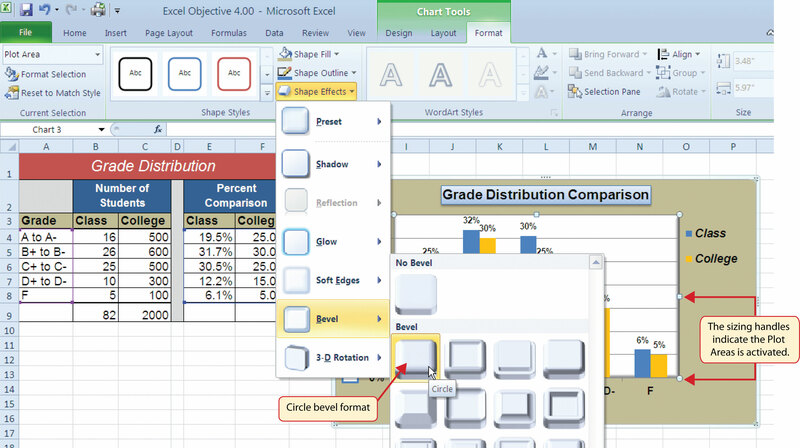 Chapter 1 "Fundamental Skills" provided a brief introduction to creating charts in Excel. This chapter provides more details for enhancing the appearance of your charts and addresses how to choose the best chart type for your data. One of the most important things to consider when using charts in Excel is that they are intended to be used for communicating an idea to an audience. Your audience can be reading your charts in a written document or listening to you in a live presentation. 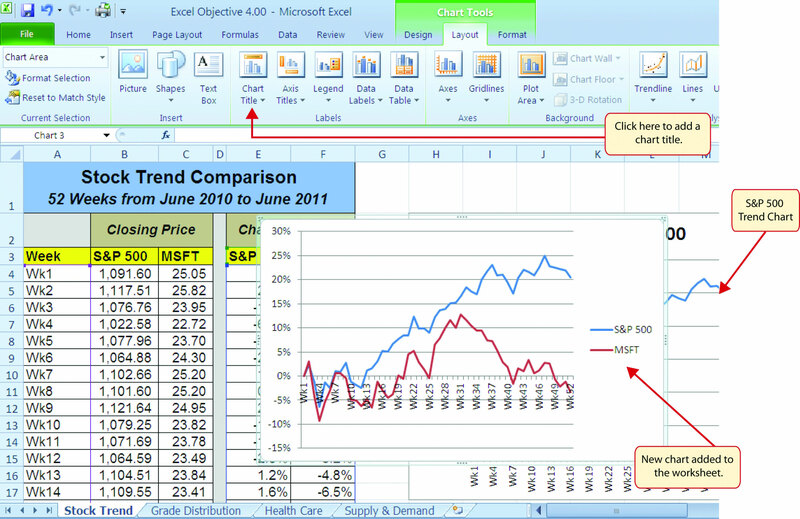 In fact, Excel charts are often imported or pasted into Word documents or PowerPoint slides, which serve this very purpose of communicating ideas to an audience. Although there are no rules set in stone for using specific charts for certain data types, some chart types are designed to communicate certain messages better than others. This chapter explores numerous charts that can be used for a variety of purposes. 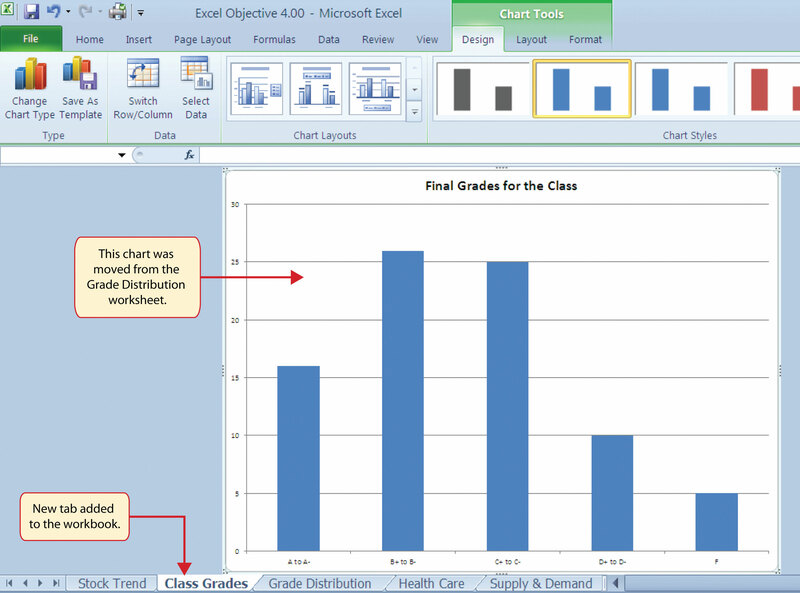 In addition, we will examine formatting charts and using those charts in Word and PowerPoint documents. 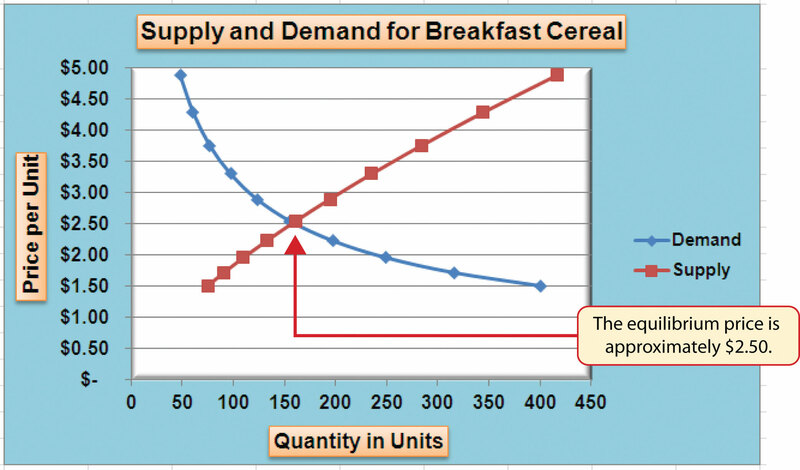 Construct a scatter chart to show the supply and demand curves for a market. Learn how to adjust the scale of the X and Y axes of a scatter chart. Add a trendline and line equation to a data series on a scatter chart. This section focuses on the scatter chartChart used when quantitative or numeric values are required for both the X and Y axes. type. What makes this chart different from the other charts demonstrated in this chapter is that values are used on both the X and Y axes. So far, the charts we have demonstrated in this chapter use categories or qualitative labels for the X axis. This means that the distance between each category on the X axis will always be the same, even if numbers are used. In a scatter chart, the X axis operates just like the Y axis. In other words, the distance between the values on the X axis will vary depending on the value of the number. 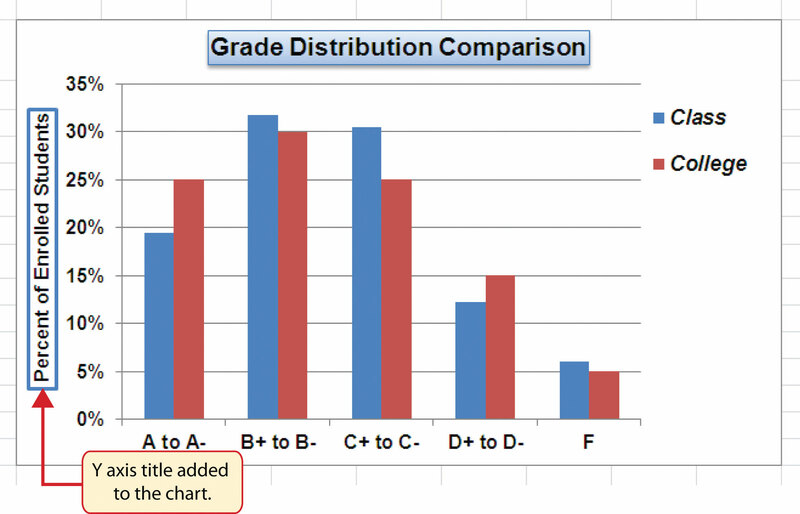 Depending on the format, we can create the scatter chart to look just like a line chart. Since both the X and Y axes contain quantitative values, the scatter chart is a valuable tool for studying various shapes or functional forms for a line chart. In fact, a common feature used with the scatter chart is the trendline and equation. 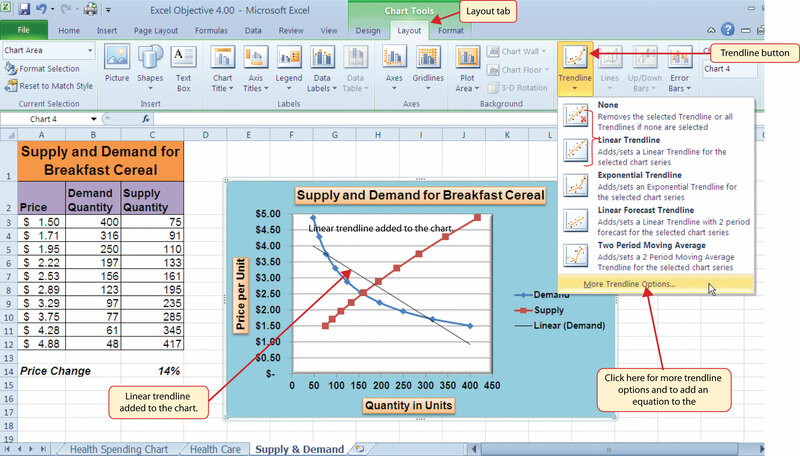 Excel can evaluate the line that is produced on a scatter chart and produce a mathematical equation. We will demonstrate these features in this section. A common use for a scatter chart is the study of supply and demand curves. This is because the data points for both the supply and demand lines require quantitative values on both the X and Y axes. The Y axis contains the price of a certain good or item; the X axis contains the quantity sold for that good or item. Fundamental economic laws state that as prices rise, sellers are willing to increase supply and sell more goods. However, the reverse is true for consumers. As prices rise, consumers purchase fewer goods. 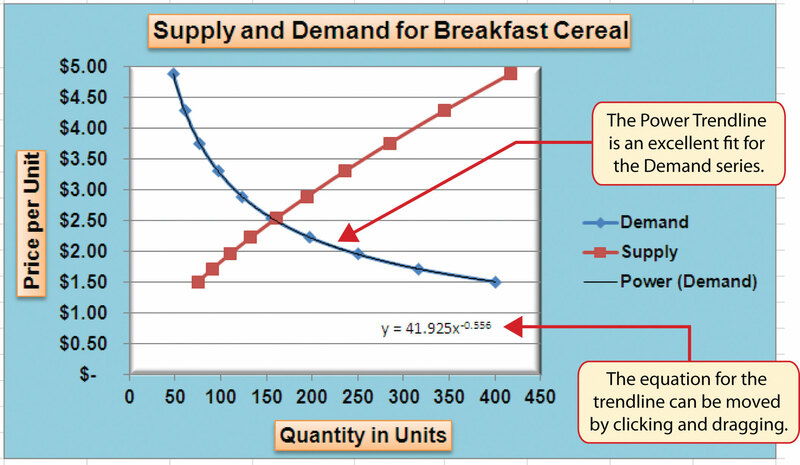 The Supply & Demand worksheet contains hypothetical data for the supply and demand of breakfast cereal. There are ten data points to show the change in supply and demand as the price changes in Column A. The values you see in Columns A through C are formula outputs that are driven by the percentage in cell C14. For example, if the percentage in cell C14 is changed to 10, each price listed in Column A will increase, as shown in Figure 4.45 "Hypothetical Supply and Demand Data". Change the value in cell C14 on the Supply & Demand worksheet to zero. Activate cell E1 on the Supply & Demand worksheet. It is important to note that this cell location is not adjacent to any data on the worksheet. Click the Scatter button from the Charts group of commands on the Insert tab of the Ribbon. Select the Scatter with Smooth Lines and Markers format from the drop-down list of options (see Figure 4.46 "Selecting a Scatter Chart Format"). This adds a blank chart to the worksheet. Click and drag the chart so the upper left corner is in the center of cell E2. Resize the chart so the left side is locked to the left side of Column E, the right side is locked to the right side of Column M, the top is locked to the top of Row 2, and the bottom is locked to the bottom of Row 17. Click the Design tab in the Chart Tools section of the Ribbon. Then click the Select Data button in the Data group of commands. This opens the Select Data Source dialog box. Click the Add button on the left side of the Select Data Source dialog box. This opens the Edit Series dialog box. Notice on this dialog box there are inputs for defining values for both the X and Y axes. Charts that we previously created using this method only had an input for putting values on the Y axis. Type the series name Demand. This should appear in the Series name input box. Press the TAB key on your keyboard to advance to the Series X values input box on the Edit Series dialog box. Highlight the range B3:B12 on the Supply & Demand worksheet. You will see this range appear in the Series X values input box after it is highlighted. Press the TAB key on your keyboard to advance to the Series Y values input box on the Edit Series dialog box. Highlight the range A3:A12 on the Supply & Demand worksheet. 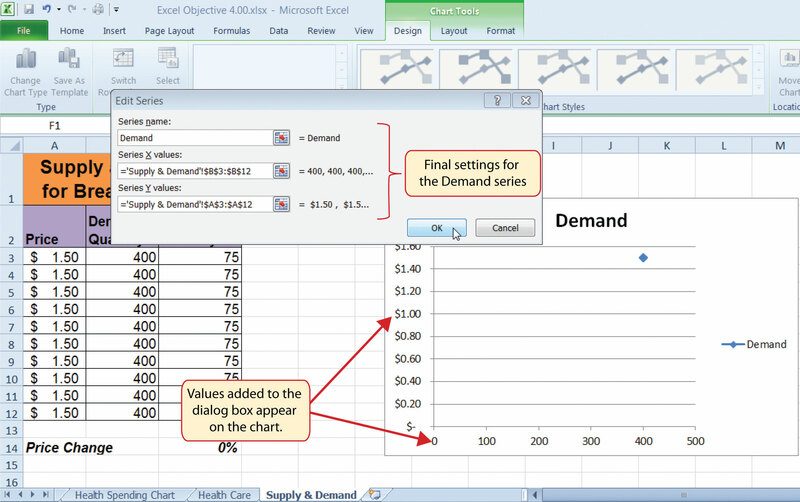 Figure 4.47 "Defining the Demand Data Series" shows the final settings in the Edit Series dialog box for the Demand data series. You will see that as the X and Y axis values are defined in the dialog box, they appear on the chart. The chart in this figure shows the price along the Y axis and quantity along the X axis. Click the OK button at the bottom of the Edit Series dialog box. Click the Add button on the left side of the Select Data Source dialog box. Type the series name Supply. This should appear in the Series name input box. Highlight the range C3:C12 on the Supply & Demand worksheet. This range appears in the Series X values input box after it is highlighted. Click the OK button at the bottom of the Select Data Source dialog box. When creating a scatter chart, it is best to start with a blank chart and add each data series individually. This is because Excel will not always guess correctly which values belong on the X and Y axes since both contain numbers. For other chart types, such as column or line charts, the X axis contains nonnumeric data so it’s easy for Excel to configure the chart you need. Figure 4.48 "Scatter Chart Showing One Price" shows the appearance of the scatter chart before any formatting enhancements are applied. Notice only two plot points are located on the chart. This is because the price change value in cell C14 is still zero. Therefore, the data are not reflecting any change in price, quantity demanded, or quantity supplied. The chart shows that at the current price of $1.50, suppliers are willing to provide fewer units compared with the number of units consumers are willing to buy. Add a title to the chart by clicking the Chart Title button in the Layout tab of the Chart Tools section of the Ribbon. Use the Above Chart option from the drop-down list. Select Subtle Effect - Orange, Accent 6 from the preset style list in the Shape Styles group of commands on the Format tab of the Ribbon. Change the font style of the chart title to Arial and the font size to 14 points. 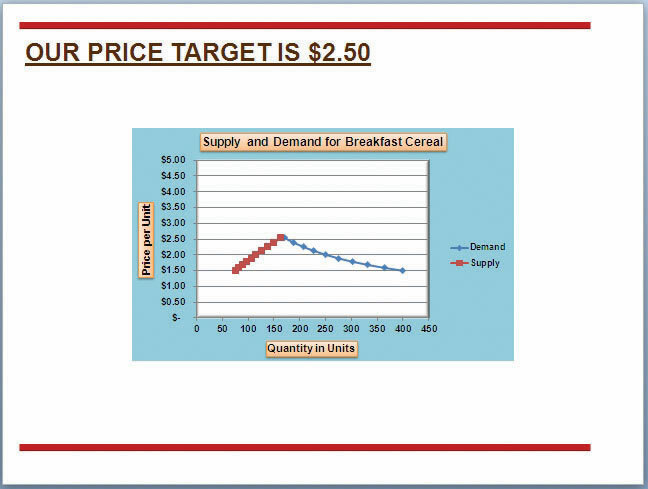 Change the wording of the chart title as follows: Supply and Demand for Breakfast Cereal. Add a title to the Y axis. Use the Rotated Title option from the Primary Vertical Axis Title drop-down list after clicking the Axis Titles button in the Layout tab of the Ribbon. Repeat steps 2 and 3 to format the Y axis title. However, change the font size to 12 points. Change the wording of the Y axis title as follows: Price per Unit. Add a title to the X axis. Repeat steps 2 and 3 to format the X axis title. However, change the font size to 12 points. Change the wording of the X axis title as follows: Quantity in Units. Make the following format changes to the X and Y axis values: font style Arial, font size 11 points, and bold. Change the color of the chart area to Aqua, Accent 5, Lighter 40% (see Figure 4.49 "Formatting Enhancements Added to the Scatter Chart"). Apply a bevel effect to the plot area. Use the Circle format option from the Bevel drop-down list of options. Change the font style of the legend to Arial and bold the font. Change the value in cell C14 to 2. Then change it to 4 and then to 8. Change the value one more time to 14. As you change the values in cell C14, you will see the lines change on the chart. Figure 4.50 "Scatter Chart with Price Change at 2%" shows the completed scatter chart when the Price Change is set to 2%, and Figure 4.51 "Scatter Chart with Price Change at 14%" shows the same chart when the Price Change is set to 14%. The point at which the demand and supply lines intersect on Figure 4.51 "Scatter Chart with Price Change at 14%" is known as the market equilibrium point. The market equilibriumA state in which the quantity demanded equals the quantity supplied at a specific price. is where the quantity demanded equals the quantity supplied at a specific price. The price where quantity demanded equals quantity supplied is referred to as the equilibrium priceThe price where quantity demanded equals quantity supplied..
Click a blank cell that is not adjacent to any data on the worksheet. Click the Scatter button in the Charts group of commands. Select a format option from the drop-down list. Move the blank chart off any cell locations containing data that will be used to create the chart. Type a name for the data series in the Series name input box in the Edit Series dialog box. Press the TAB key on your keyboard to advance to the Series X values input box. Highlight the range of cells on your worksheet that contain values to be plotted on the X axis. Press the TAB key on your keyboard to advance to the Series Y values input box. Highlight the range of cells on your worksheet that contain values to be plotted on the Y axis. Click the OK button in the Edit Series dialog box. Repeat steps 7 through 13 for each data series you want to add to the chart. Click anywhere on the Y axis of the chart. Click the Format Selection button in the Layout tab of the Chart Tools section of the Ribbon. This opens the Format Axis dialog box. Click the Fixed option next to the Minimum setting under the Axis Options in the Format Axis dialog box. This ensures that the minimum value for the Y axis will always be zero. Click the Fixed option next to the Maximum setting under the Axis Options in the Format Axis dialog box. Click in the input box next to the Maximum setting. Remove the 1.6 and enter the number 5.0. We will not be studying the behavior of supply and demand beyond a $5.00 price point, so there is no need to extend the Y axis beyond this point. Click the Fixed option next to the Major Unit setting under the Axis Options in the Format Axis dialog box. Click in the input box next to the Major Unit setting and change the value from 0.2 to 0.5 (see Figure 4.52 "Setting the Y Axis Scale"). This allows us to measure the plot points in $0.50 intervals along the Y axis. When the axis extends to $5.00, $0.20 intervals may place too many values along the Y axis, making it difficult to read. Click anywhere along the X axis of the chart. Click the Format Selection button in the Layout tab of the Chart Tools section of the Ribbon. This opens the Format Axis dialog box for the X axis. Click the Fixed option next to the Minimum setting under the Axis Options in the Format Axis dialog box. This ensures that the minimum value for the X axis will always be zero. Click in the input box next to the Maximum setting. Remove the 500.0 and enter the number 450.0. The number of units supplied or demanded will not exceed 450 based on the price points in our study. There is no need to extend the X axis to 500. Click in the input box next to the Major Unit setting and change the value from 100.0 to 50.0. This allows us to measure the plot points in 50-unit intervals along the X axis. Change the value in cell C14 to 2. Then change it to 4 and then to 8. Change the value one more time to 14. As you change the values in cell C14, the lines change but they no longer jump or shift since the scale of both axes is fixed. Figure 4.53 "Final Appearance of the Scatter Chart" shows the final appearance of the scatter chart after the scale is set for both the X and Y axes. Notice that market equilibrium is achieved at a price of approximately $2.50. Set the value in cell C14 on the Supply & Demand worksheet to 14. Click anywhere in the chart area of the scatter chart to activate it. Click the Trendline button in the Layout tab of the Ribbon. Select the Linear Trendline option from the drop-down list. Select the Demand option from the Add Trendline dialog box and click the OK button. This adds a new line to the plot area of the chart as well as the legend. Figure 4.54 "Adding a Linear Trendline" shows the scatter chart after adding a linear trendline. Notice that the line goes through only two points on the demand line. This indicates that this trendline may not be a good fit for the line that has been created on the chart. Click the Trendline button in the Layout tab of the Ribbon. Select the None option from the drop-down list. This removes the trendline from the chart. Click the Trendline button in the Layout tab of the Ribbon again. This time, select More Trendline Options from the drop-down list. 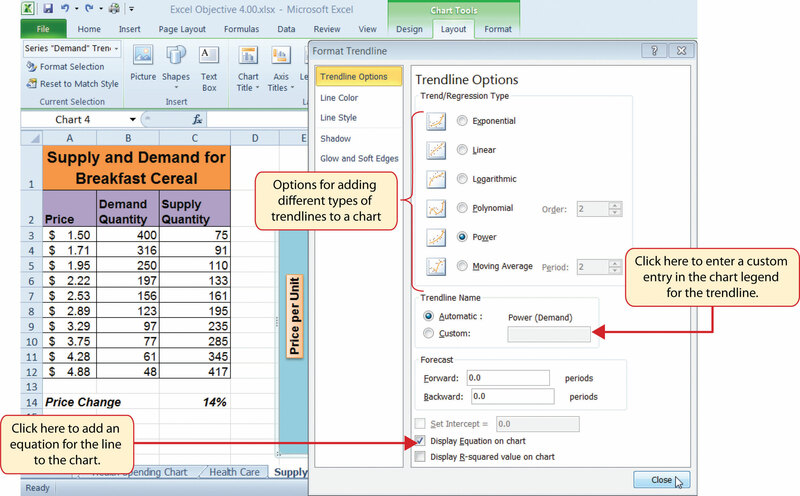 Select the Demand option from the Add Trendline dialog box and click OK. This opens the Format Trendline dialog box. 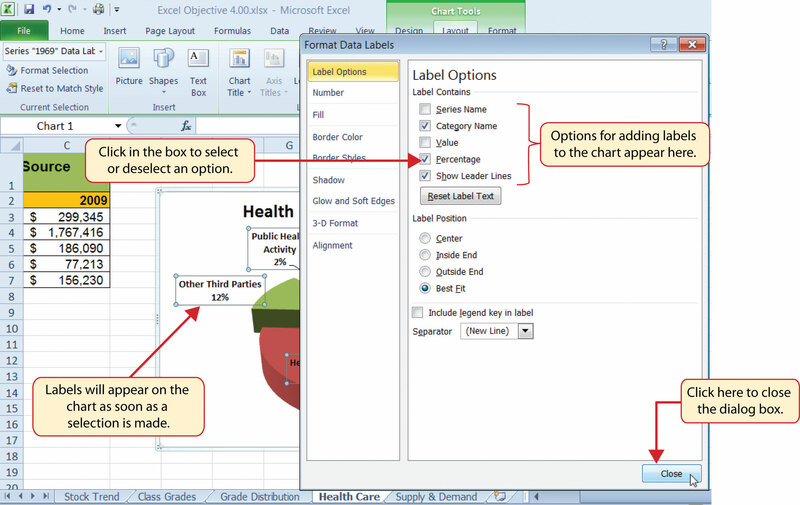 Select the Power option from the Format Trendline dialog box. Click the “Display Equation on chart” option at the bottom of the Format Trendline dialog box (see Figure 4.55 "The Format Trendline Dialog Box"). Click the Close button at the bottom of the Format Trendline dialog box. Figure 4.56 "Scatter Chart with a Power Trendline" shows the scatter chart with the Power trendline added for the demand series. Notice that the line fits perfectly over the demand series in the plot area. In fact, it may be difficult to see the line in the figure. This indicates that the trendline is an excellent fit for the demand line. As a result, we can be confident in using this line to predict other demand values along the X and Y axes. You can also see that the equation for this trendline has been added to the plot area of the chart. We can use the equation to calculate the price for each quantity value substituted for X. For example, if the number 150 is substituted for X in the equation, the result is a price of $2.59. Based on the values used to create the chart, this result appears to be accurate. Select one of the preset trendline options from the drop-down list or select More Trendline Options to open the Add Trendline dialog box. 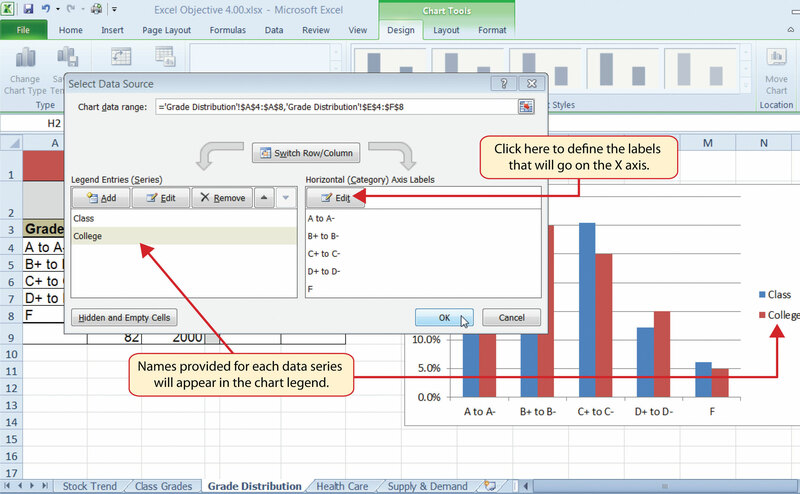 Select a data series in the Add Trendline dialog box and click the OK button. Select the “Display Equation on chart” option from the Format Trendline dialog box to add the trendline equation to the chart. Click the Close button at the bottom of the dialog box. When creating a scatter chart, it is best to start with a blank chart and add each data series individually. The highlight and click method is less reliable since numeric values are assigned to both the X and Y axes. As a result, Excel often guesses incorrectly which values are assigned to the X and Y axes. Finding the best fit for a trendline is often a matter of trial and error. You may have to try a few different trendlines to determine which form is the best fit for your data series. 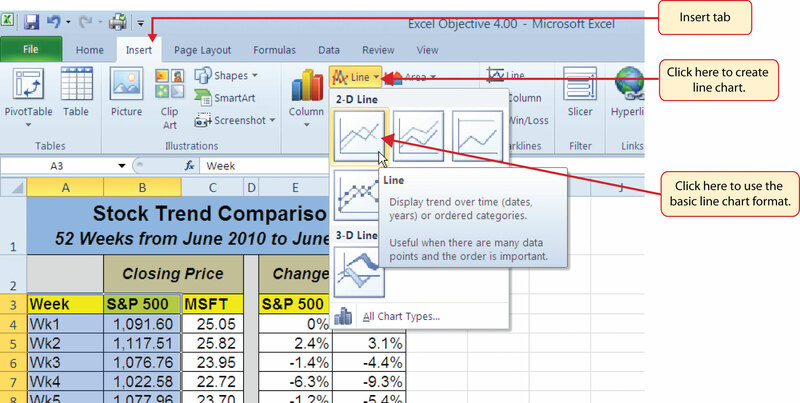 You must open the Format Trendline dialog box to add the line equation to the plot area of the chart. Which of the following is the best chart type to use if you need to create a line chart where both the X and Y axes contain numeric values? Which of the following methods allows you to set the scale of the Y axis? Activate the Y axis and click the Scale button in the Page Layout tab of the Ribbon. Activate the Y axis and click the Axes button in the Layout tab of the Ribbon; select the Primary Vertical Axis option and then select More Primary Vertical Axis Options. 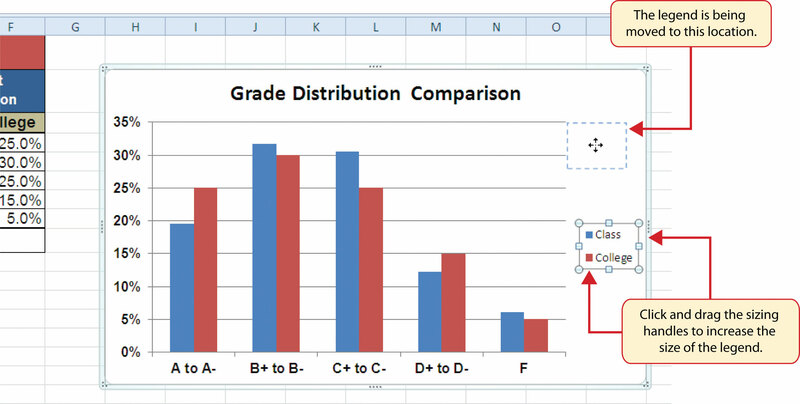 Learn how to paste an image of an Excel chart into a Word document. 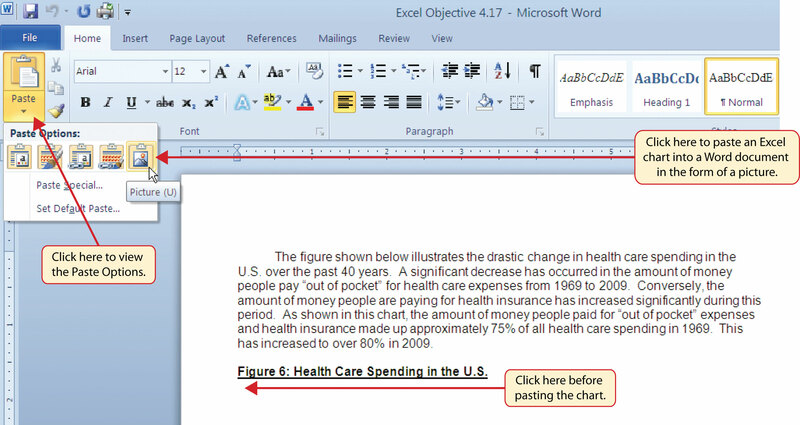 Learn how to paste a link to an Excel chart into a PowerPoint slide. Charts that are created in Excel are commonly used in Microsoft Word documents or for presentations that use Microsoft PowerPoint slides. 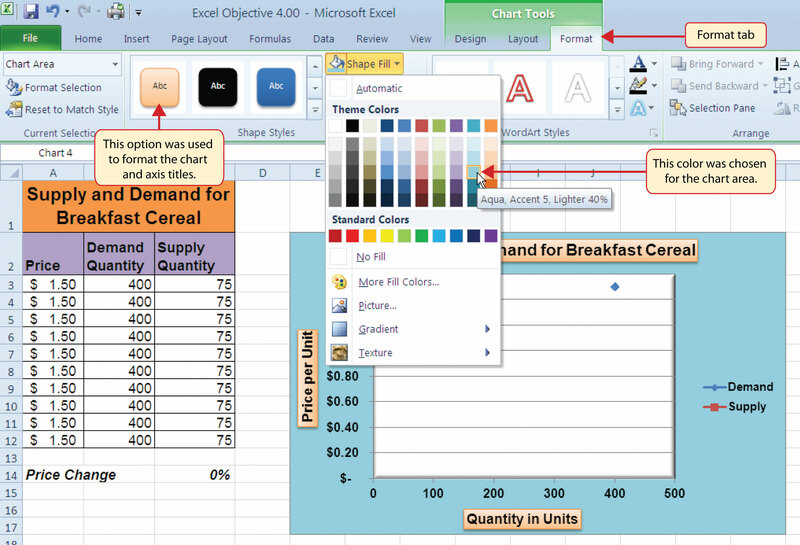 Excel provides options for pasting an image of a chart into either a Word document or a PowerPoint slide. You can also establish a link to your Excel charts so that if you change the data in your Excel file, it is automatically reflected in your Word or PowerPoint files. We will demonstrate both methods in this section. 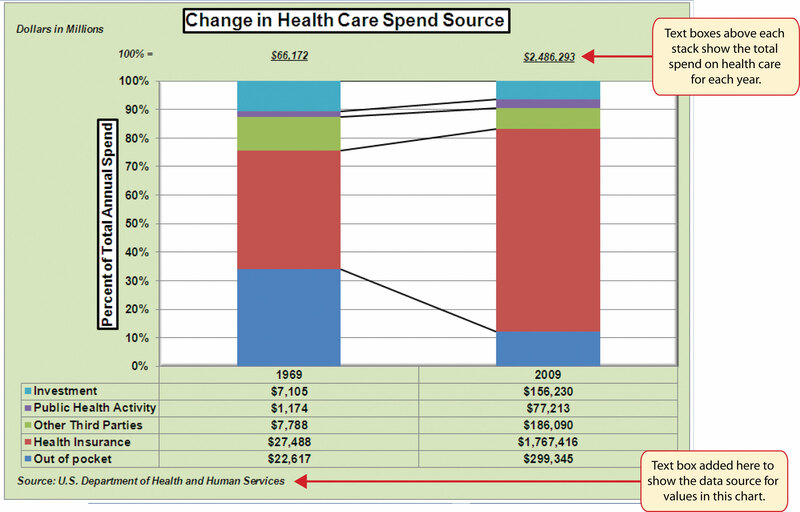 Click below the figure heading in the Word document that reads: Figure 6: Health Care Spending in the U.S. The image of the stacked column chart will be placed below this heading. Open the Excel Objective 4.16 follow-along file. 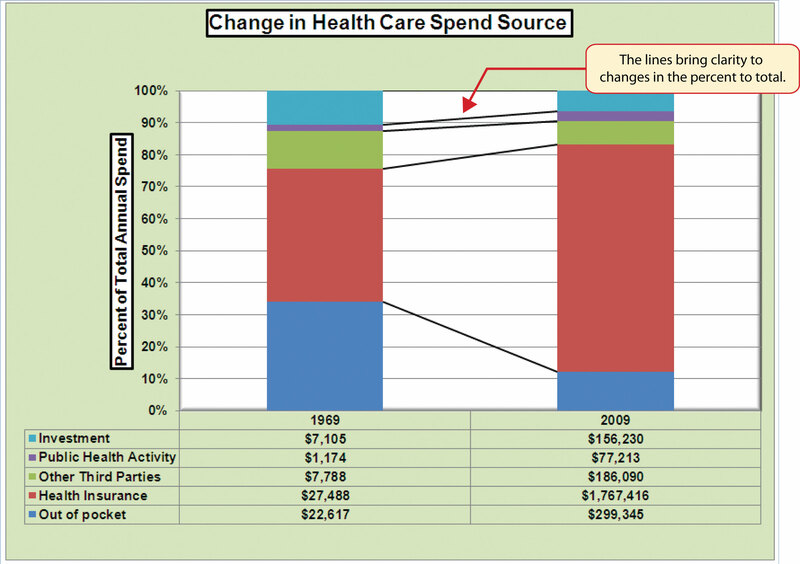 Activate the Change in Health Care Spend Source chart in the Health Spending Chart worksheet. 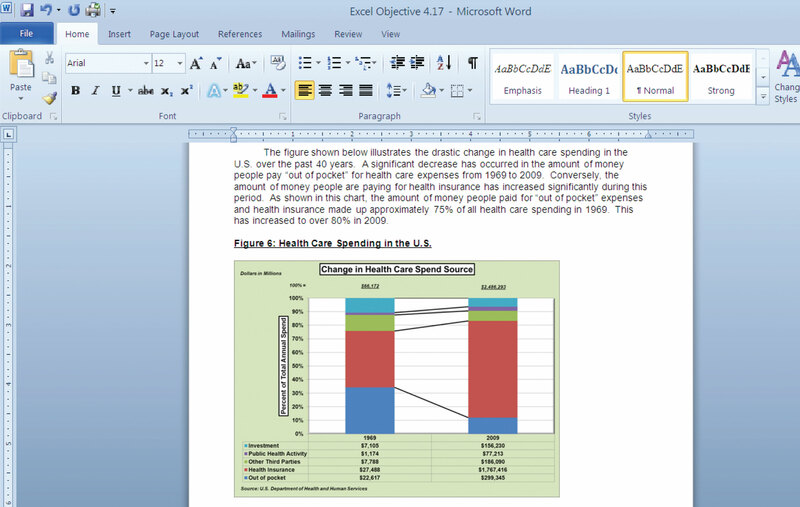 Go back to the Excel Objective 4.17 Word document by clicking the file in the taskbar. Click the drop-down arrow below the Paste button in the Home tab of the Ribbon. Click the Picture option from the drop-down list, which is the last option on the far right (see Figure 4.57 "Paste Picture Option for Word"). Click anywhere on the picture of the chart to activate it. Click the Format tab under the Picture Tools section of the Ribbon (see Figure 4.58 "Changing the Size of a Picture in Word"). Click the down arrow on the Shape Width button in the Size group of commands (see Figure 4.58 "Changing the Size of a Picture in Word"). Continue to click the down arrow until the width of the picture is 5.5. As you reduce the width of the picture, the height is automatically reduced as well. 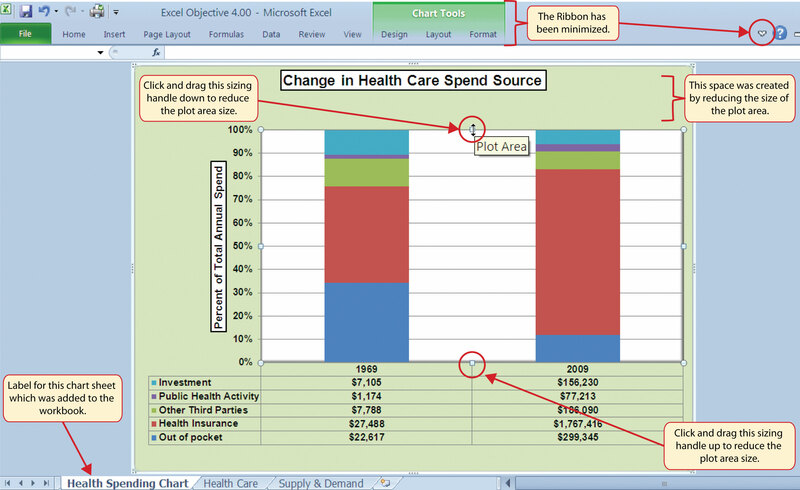 Figure 4.59 "Final Appearance of Pasting a Chart Image into Word" shows the final appearance of the Change in Health Care Spend Source chart pasted into a Word document. It is best to use either the Shape Width or Shape Height buttons to reduce the size of the chart. Using either button automatically reduces the height and width of the chart in proper proportion. If you choose to use the sizing handles to resize the chart, holding the SHIFT key while clicking and dragging on a corner sizing handle will also keep the chart in proper proportion. 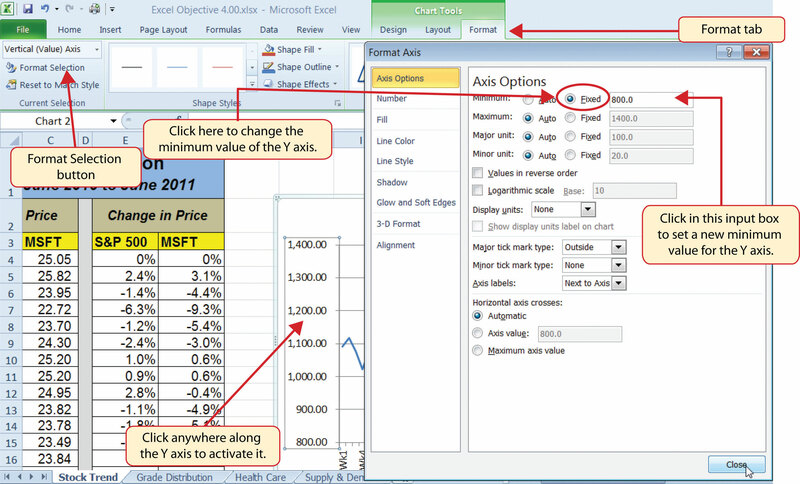 Activate an Excel chart and click the Copy button in the Home tab of the Ribbon. 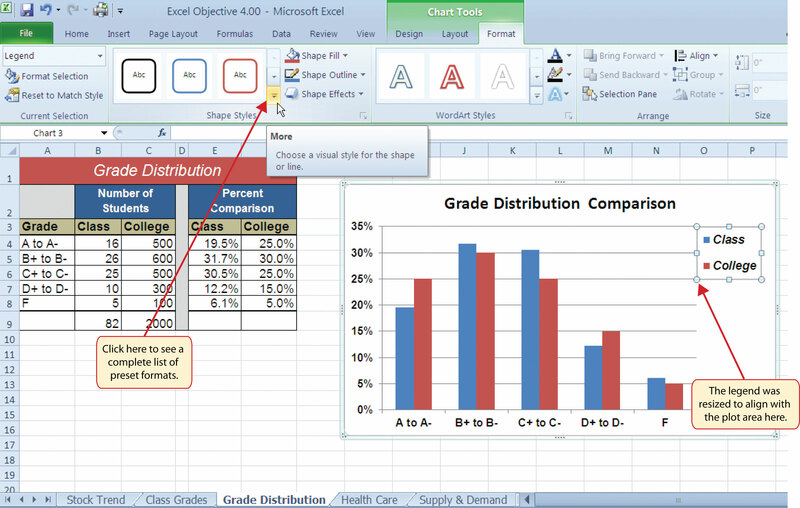 Click on the location in the Word document where the Excel chart will be pasted. Click the down arrow of the Paste button in the Home tab of the Ribbon. Click the Picture option from the drop-down list. Click the Format tab in the Picture Tools section of the Ribbon. Resize the picture by clicking the up or down arrow on the Shape Width or Shape Height buttons. 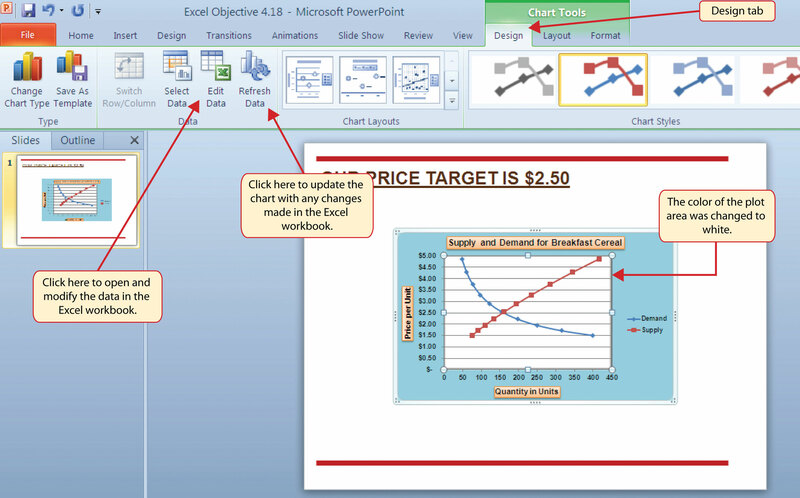 Activate the scatter chart in the Supply & Demand worksheet. Go back to the Excel Objective 4.18 PowerPoint file by clicking the file in the taskbar. Click the down arrow below the Paste button in the Home tab of the Ribbon in the PowerPoint file. Select the Keep Source Formatting & Link Data option from the drop-down list (see Figure 4.60 "Creating a Link to an Excel Chart in PowerPoint"). 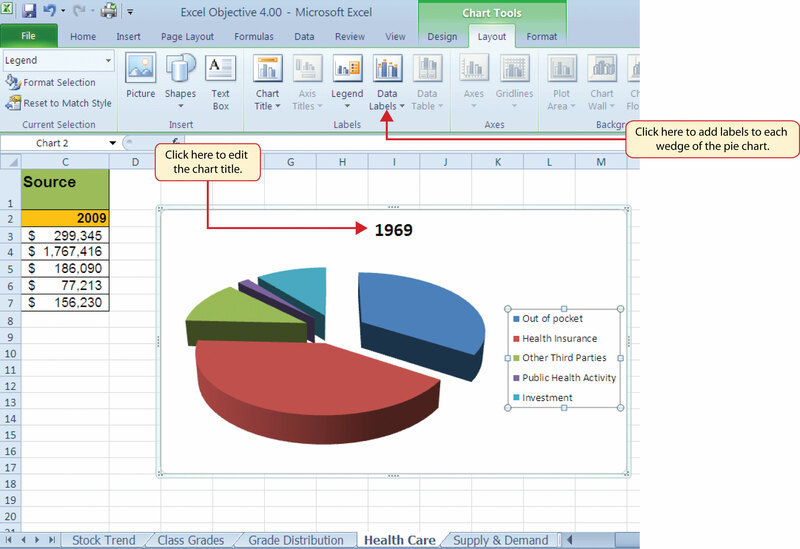 This pastes an image of the Excel chart into the PowerPoint slide. In addition, a link is created so that any changes made to the chart appear on the PowerPoint slide. Click anywhere in the plot area of the scatter chart pasted into the PowerPoint slide. 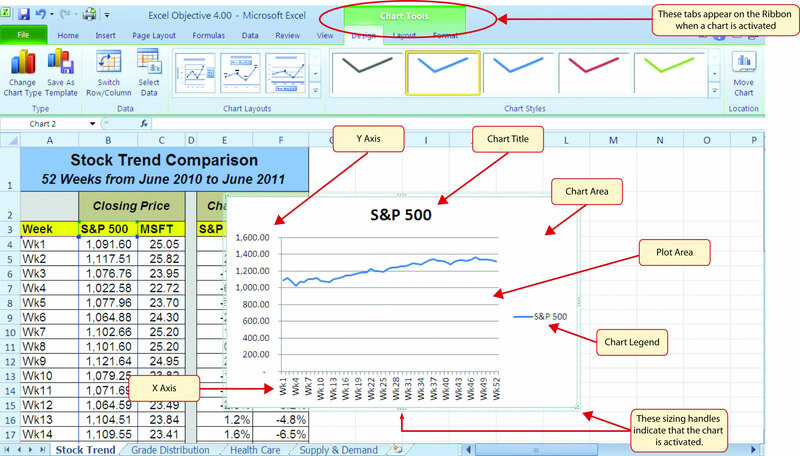 You will see the same Excel Chart Tools tabs added to the Ribbon (see Figure 4.61 "Modifying an Excel Chart Pasted into a PowerPoint Slide"). Click the down arrow next to the Shape Fill button in the Format tab of the Ribbon. 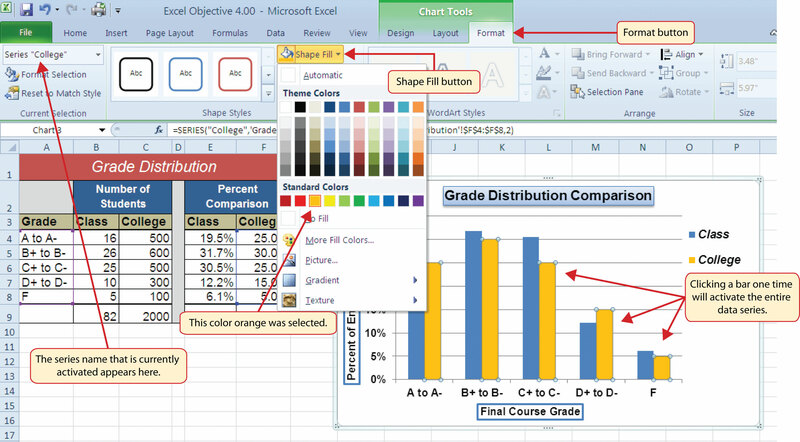 Select the white color block from the palette (see Figure 4.61 "Modifying an Excel Chart Pasted into a PowerPoint Slide"). Go back to the Excel Objective 4.16 file by clicking it in the taskbar. In the Supply & Demand worksheet, change the value in cell C14 to 6. Go back to the Excel Objective 4.18 PowerPoint file by clicking it in the taskbar. Click the Design tab in the Chart Tools section of the Ribbon. 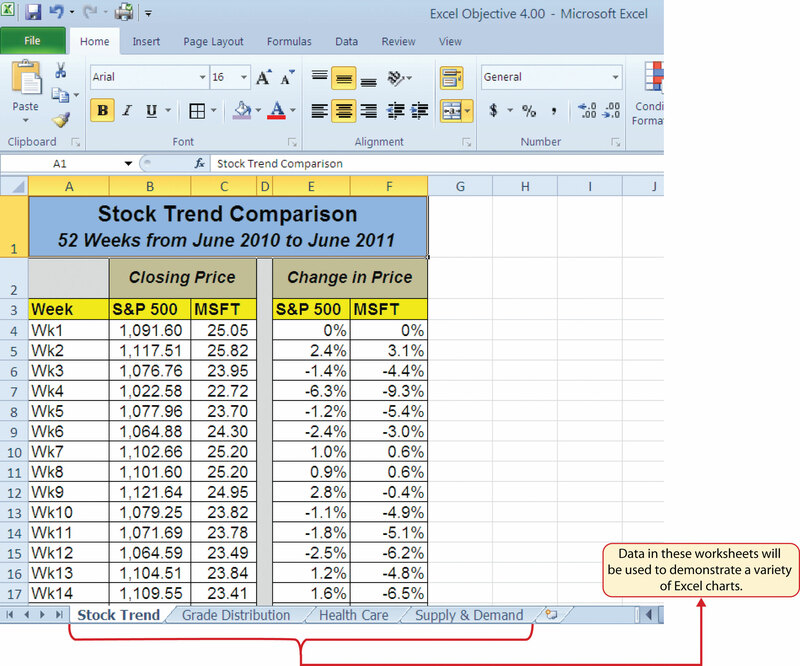 Click the Refresh Data button (see Figure 4.62 "Refreshing a Linked Excel Chart Pasted into a PowerPoint Slide"). 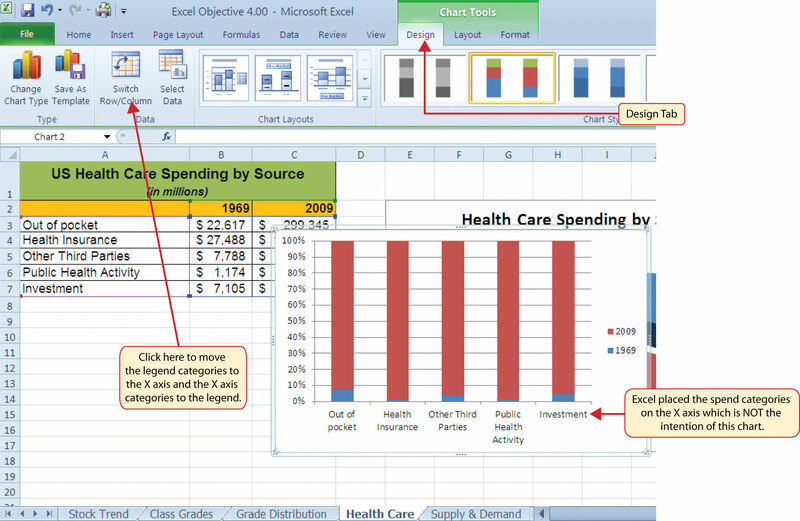 The change made in the Excel workbook is now reflected on the PowerPoint slide. When creating a link to a chart in Word or PowerPoint, you must refresh the data if you make any changes in the Excel workbook. This is especially true if you make changes in the Excel file prior to opening the Word or PowerPoint file that contains a link to a chart. To refresh the chart, make sure it is activated, then click the Refresh Data button in the Design tab of the Ribbon. Forgetting this step can result in old or erroneous data being displayed on the chart. 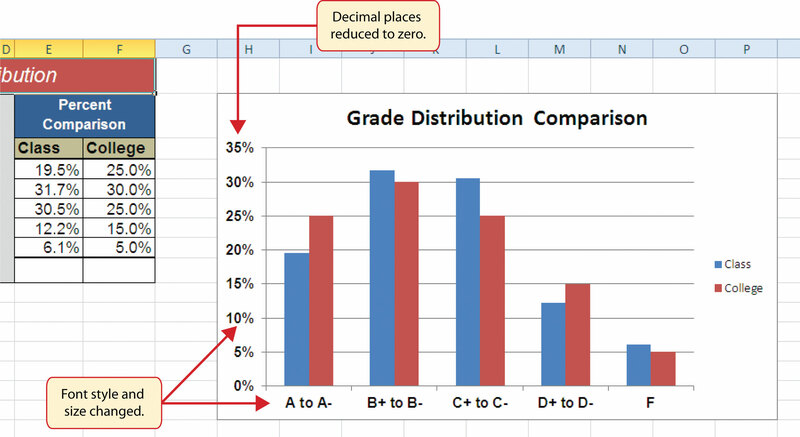 Figure 4.62 "Refreshing a Linked Excel Chart Pasted into a PowerPoint Slide" shows the appearance of the scatter chart in the PowerPoint slide after the color of the plot area was changed back to white. Figure 4.63 "Final Chart Linked to a PowerPoint Slide" shows the appearance of the scatter plot after the change was made in the Supply & Demand worksheet in the Excel file. The change that was made in the Excel file will appear in the PowerPoint file after clicking the Refresh Data button. 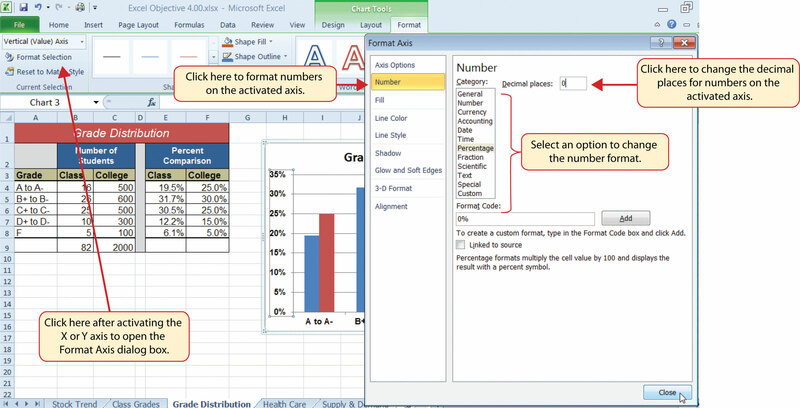 When creating a link to an Excel chart in Word or PowerPoint, you must keep the Excel workbook in its original location on your computer or network. If you move or delete the Excel workbook, you will get an error message when you try to update the link in your Word or PowerPoint file. You will also get an error if the Excel workbook is saved on a network drive that your computer cannot access. These errors occur because the link to the Excel workbook has been severed. Therefore, if you know in advance that you will be using a USB drive to pull up your documents or presentation, move the Excel workbook to your USB drive before you establish the link in your Word or PowerPoint file. Click in the PowerPoint slide where the Excel chart will be pasted. Click the Keep Source Formatting & Link Data option from the drop-down list. Click the Refresh Data button in the Design tab of the Ribbon to ensure any changes in the Excel file are reflected in the chart. 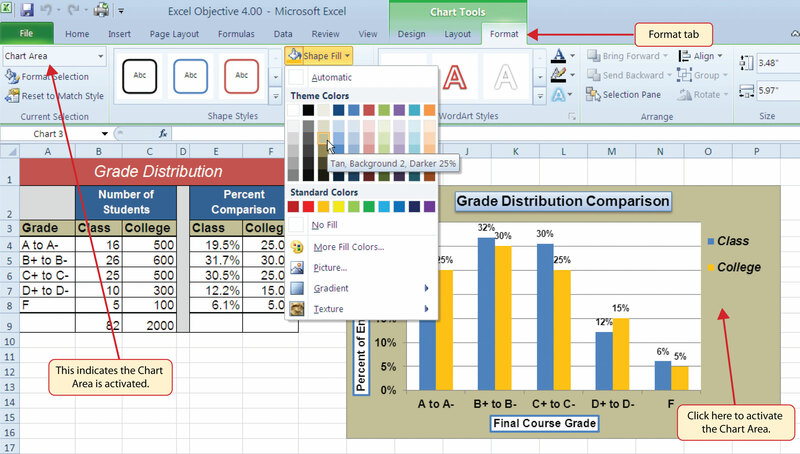 When pasting an image of an Excel chart into a Word document or PowerPoint file, use the Picture option from the Paste drop-down list of options. When creating a link to a chart in Word or PowerPoint, you must refresh the data if you make any changes in the Excel workbook. When pasting an image of an Excel chart into a Word document, which of the following commands would you use? Click the down arrow below the Paste button in the Home tab of the Ribbon, and select the Picture option from the drop-down list. Click the down arrow below the Paste button in the Home tab of the Ribbon, and select the Embed Workbook option from the drop-down list. Click the Object button in the Insert tab of the Ribbon. Which of the following is true with respect to creating a linked chart image in a PowerPoint slide? The image will always reflect any changes that are made in the Excel workbook. You will not be able to run PowerPoint in slide show mode unless the Excel workbook is open. 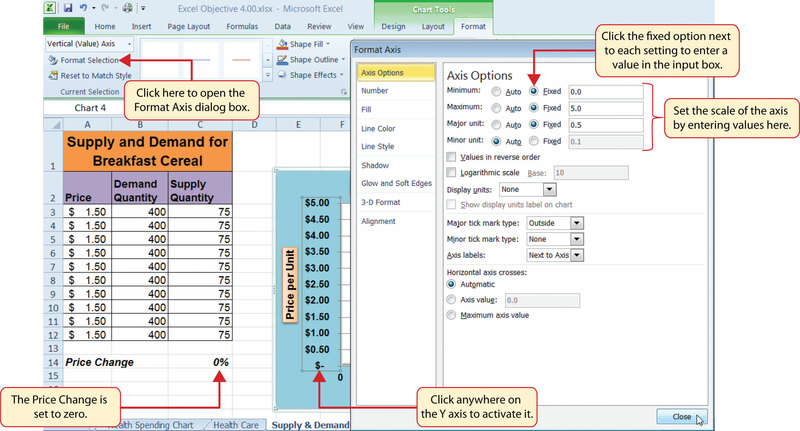 You must activate the image and click the Refresh Data button in the Design tab of the Ribbon to ensure any changes made in the Excel workbook are reflected in the image pasted into the PowerPoint slide. 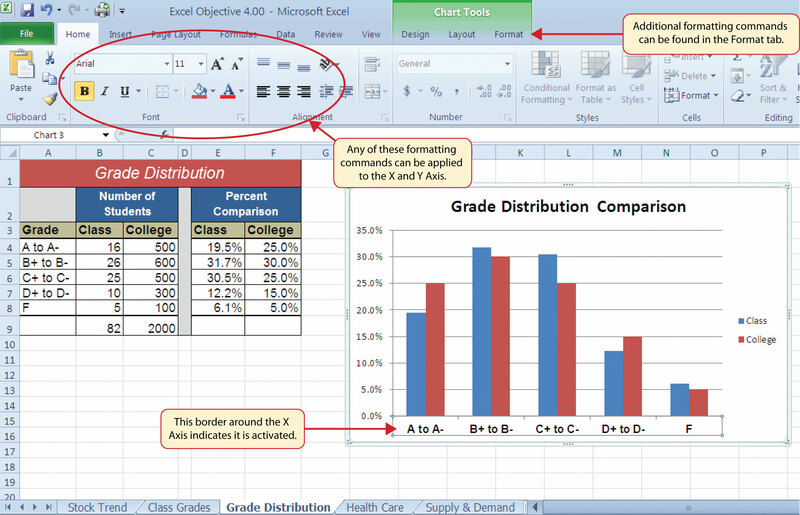 You must have the Excel workbook open in order for the image to be refreshed in the PowerPoint slide. If you are contemplating a career in the fashion industry, you will likely be working with an apparel size analysis report. Understanding the most commonly purchased sizes is critical for any company in the fashion industry. For example, in the apparel manufacturing industry, you have to know how many units to manufacture in each size for a particular garment. In addition, you have to know the exact garment specifications for the sizes small, medium, large, and so on. If you are pursuing a career on the retail side of the fashion industry, your job may be a little more complicated. You have to know how many units of each size of a particular garment to ship to each store. There is nothing more devastating to a fashion company’s sales than luring customers into a store with a great-looking garment and not having their sizes available. The charts presented in this chapter can be valuable tools in analyzing size information for garments. This exercise uses the concept of the frequency distribution and frequency comparison to analyze demand by garment size for the knit tops department of an apparel manufacturing company. The information displayed on these charts can be used to establish the production plan for manufacturing the garments for this department. Begin this exercise by opening the file named Chapter 4 CiP Exercise 1. Highlight the range A4:A8 on the Size Analysis worksheet. Hold down the CTRL key on your keyboard and highlight the range C4:C8. Click the Column button in the Insert tab of the Ribbon. Select the 2-D Clustered Column format option from the drop-down list. Move the column chart to a new chart sheet by clicking the Move Chart button in the Design tab of the Ribbon. The sheet tab label should read Tops Size Chart. Remove the legend by clicking it once and pressing the DELETE key on your keyboard. Click the Chart Title button in the Layout tab of the Chart Tools section of the Ribbon. Select the Above Chart option from the drop-down list. Format the chart title by selecting Subtle Effect - Red, Accent 2 from the preset shape style formats in the Format tab of the Ribbon. Change the font style of the chart title to Arial and change the font size to 24 points. Click in the chart title and delete text. 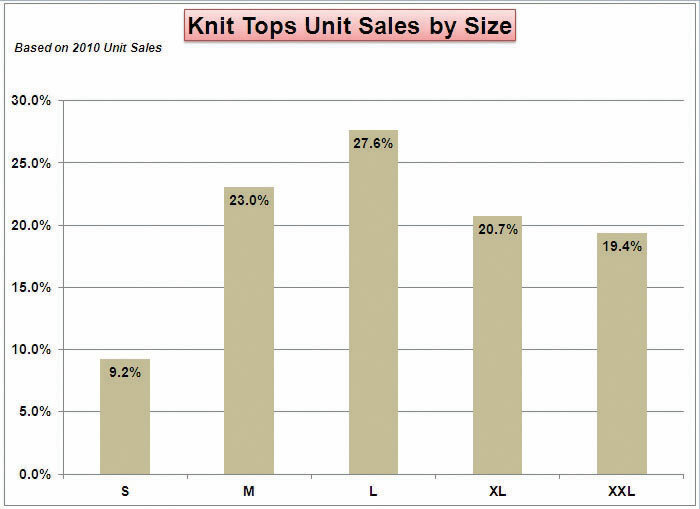 Type Knit Tops Unit Sales by Size. Click any of the bars in the plot area of the chart. Click the down arrow on the Shape Fill button in the Format tab of the Ribbon. Select the Tan, Background 2, Darker 25% color from the drop-down palette. Click the Data Labels button in the Layout tab of the Ribbon. Select the Inside End option from the drop-down list. Click any data label on the bars of the chart one time. Use the formatting commands in the Home tab of the Ribbon to change the font style to Arial, change the font size to 14 points, and bold the font. Use the formatting commands in the Home tab of the Ribbon to format the X and Y axes. Click anywhere on the axis to activate it. Then change the font style to Arial, change the font size to 14 points, and bold the font. Click anywhere on the plot area of the chart to activate it. Click and drag down the top center sizing handle approximately one inch. There should be about one inch of space between the bottom of the chart title and the top of the plot area. Click the Text Box button in the Insert tab of the Ribbon. Starting from the far upper left side of the chart area, approximately one-half inch below the top, click and drag a box that is approximately two and a half inches wide and one-half inch high. Format the text box using the commands in the Home tab of the Ribbon. Change the font style to Arial, change the font size to 12 points, and select the bold and italics commands. Type the following in the text box: Based on 2010 Unit Sales. Click cell G4 on the Size Analysis worksheet. Click the Column button in the Insert tab of the Ribbon and select the 3-D Clustered Column format from the drop-down list. Move the chart so the upper left corner is in the center of cell G2. Resize the chart so the left side is locked to the left side of Column G, the right side is locked to the right side of Column N, the top is locked to the top of Row 2, and the bottom is locked to the bottom of Row 18. Click the Select Data button in the Design tab of the Ribbon. Type Knit Tops in the Series name input box. Then press the TAB key on your keyboard, highlight the range C4:C8, and click the OK button on the Edit Series dialog box. Click the Add button again on the Select Data Source dialog box. Type the word Company in the Series name input box. Then press the TAB key on your keyboard, highlight the range E4:E8, and click the OK button on the Edit Series dialog box. Highlight the range A4:A8 and click the OK button on the Axis Labels dialog box. Then click the OK button on the Select Data Source dialog box. Add a chart title above the plot area of the chart. 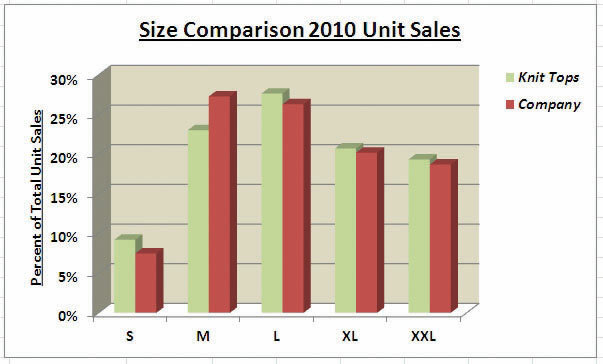 The title should state the following: Size Comparison 2010 Unit Sales. Select the Underline command in the Home tab of the Ribbon. Add a title to the Y axis. Select the Rotated Title format from the drop-down list under the Primary Vertical Axis Title option in the Axis Titles button on the Layout tab of the Ribbon. The title should state: Percent of Total Unit Sales. Change the font size of the title to 12 points and select the Underline command in the Home tab of the Ribbon. Click anywhere on the Y axis to activate it. Then click the Format Selection button in the Layout tab of the Ribbon. Click the Number option on the left side of the Format Axis dialog box. Click in the Decimal Places input box and change the value to zero. Then click the Close button at the bottom of the Format Axis dialog box. Use the formatting commands in the Home tab of the Ribbon to format the X and Y axes. Click anywhere on the axis to activate it. Then change the font size to 12 points and bold the font. Click and drag the legend so the top border of the legend aligns with the top line of the chart plot area. Use the formatting commands in the Home tab of the Ribbon to increase the font size of the legend to 12 points and select the bold and italics commands. Click anywhere on the plot area to activate it. Then click the down arrow on the Shape Fill button in the Format tab of the Ribbon. Select the Tan, Background 2, Darker 10% option from the color palette. Click any of the bars representing the Knit Tops data series. Then click the down arrow on the Shape Fill button in the Format tab of the Ribbon. Select the Olive Green, Accent 3, Lighter 40% option from the color palette. Save the workbook by adding your name in front of the current workbook name (i.e., “your name Chapter 4 CiP Exercise 1”). The following exercise continues the fashion industry theme that was presented in part A of this exercise. In this exercise, we focus on the retail side of the fashion industry. Markdowns are a critical component for operating a successful fashion retail business. When an item is marked down, the price is reduced by a certain amount with the expectation that it will increase the number of units sold. This is also known as putting an item on sale. You have probably seen, and perhaps taken advantage of, these sales during a visit to your local mall. A surplus of inventory can present considerable losses for a fashion retailer. Therefore, the timing and the amount of discount taken on an item is critical in managing the inventory for these companies. 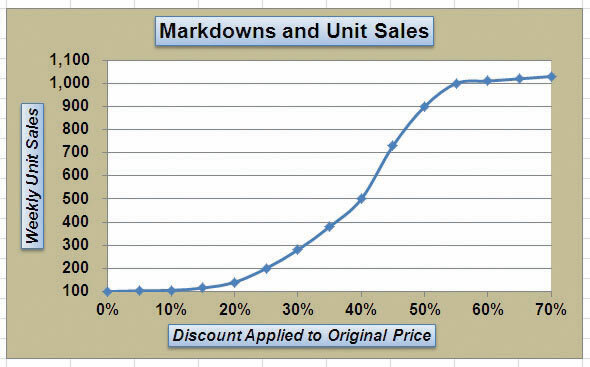 The increase in the number of units sold will depend on the size of the discount offered on a particular item. The scatter chart demonstrated in this chapter is a valuable tool in analyzing the rate at which unit sales increase when discounts are offered on an item. Begin this exercise by opening the file named Chapter 4 CiP Exercise 1 or continue with this file if you completed Comprehensive Review Part A.
Click cell E2 on the Markdown Analysis worksheet. Click the Scatter button on the Insert tab of the Ribbon. Select the Scatter with Smooth Lines and Markers format option. Move the chart so the upper left corner is in the center of cell E2. Resize the chart so the left side is locked to the left side of Column E, the right side is locked to the right side of Column M, the top is locked to the top of Row 2, and the bottom is locked to the bottom of Row 18. Click the Select Data button in the Design tab of the Ribbon. Then click the Add button on the Select Data Source dialog box. Click the OK button on the Edit Series and Select Data Source dialog boxes. Remove the legend from the chart. Click anywhere on the Y axis to activate it. Click the Format Selection button in the Format tab of the Ribbon. Change the scale of the Y axis so the minimum value is set to 100 units. Then click the Close button at the bottom of the Format Axis dialog box. Change the scale of the X axis so the maximum value is set to 70%. Format the X and Y axes to an Arial font style, bold, and font size of 12 points. 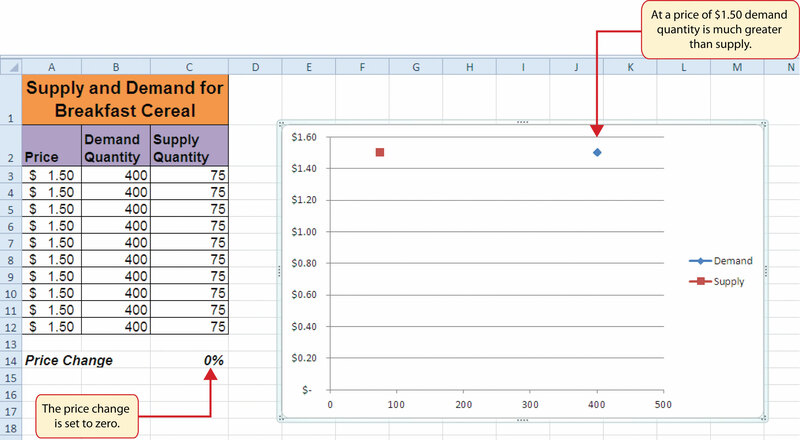 Add an X axis title that reads Discount Applied to Original Price. Format the title with the Subtle Effect - Blue, Accent 1 preset shape style. Change the font style to Arial, bold, italics, and font size of 12 points. Add a Y axis title that reads Weekly Unit Sales. Use the Rotated Title alignment. Format the title with the Subtle Effect - Blue, Accent 1 preset shape style. Change the font style to Arial, bold, italics, and font size of 12 points. Format the chart title with the Subtle Effect - Blue, Accent 1 preset shape style. Change the font style to Arial and change the font size to 16 points. Change the color of the chart area to Tan, Background 2, Darker 25%. Notice that when a discount is offered up to 20% off the original price, there is very little change in the number of units sold. This is typical in the fashion industry. If customers are not willing to pay full price for a particular style or color, it usually takes a substantial discount to convince them to buy. Excel can be a valuable tool for constructing a personal budget. As mentioned in Chapter 2 "Mathematical Computations", developing a personal budget is an important exercise for establishing a path to financial security. One of the benefits of developing and maintaining a personal budget is that it allows you to maintain a healthy level of savings. Money that you save can be used to buy personal items. However, it can also be used to sustain your everyday expenses in the event you lose a job or source of income. Without a reasonable level of savings, you may be forced to borrow money, which could come at very high interest expenses in the form of credit cards. Once you accumulate large debt balances at high interest rates, it can take years to pay off that debt, and the interest expense that you pay reduces savings for more important purposes such as college or retirement. What most people do not realize is that even what appears to be the most trivial overage in spending can rapidly eliminate any savings and quickly turn into debt. The purpose of this exercise is to use the charts in this chapter to evaluate a personal expense plan and to analyze the relationship that spending and net income have on your ability to save money. Begin this exercise by opening the file named Chapter 4 CiP Exercise 2. Create a pie chart using the data in the Expense Plan worksheet. The chart should show the percent of total for the categories in the range A3:A10 based on the Annual Spend values in the range D3:D10. Use the Exploded Pie in 3-D format. Move the pie chart to a separate chart sheet. The tab name for the chart sheet should read Expense Chart. 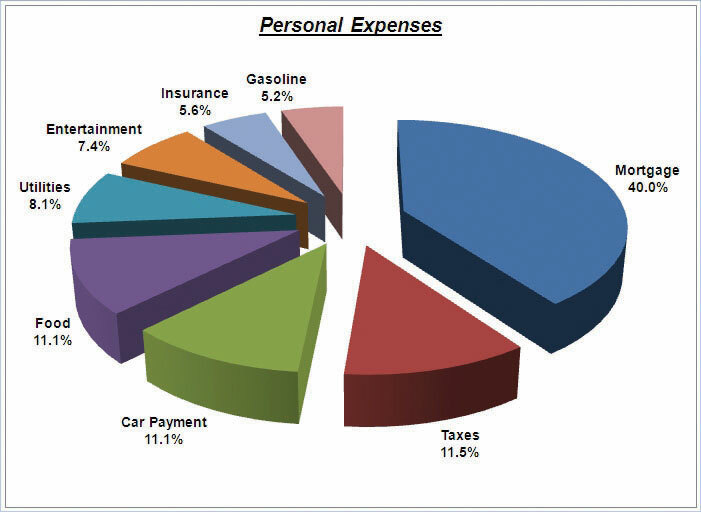 Edit the title of the chart to read Personal Expenses. Format the chart title with an Arial font style, bold, italics, and font size of 20 points. Add data labels to each section of the pie chart. Show only the category name and the percentage. Format the percentage to show one decimal place. 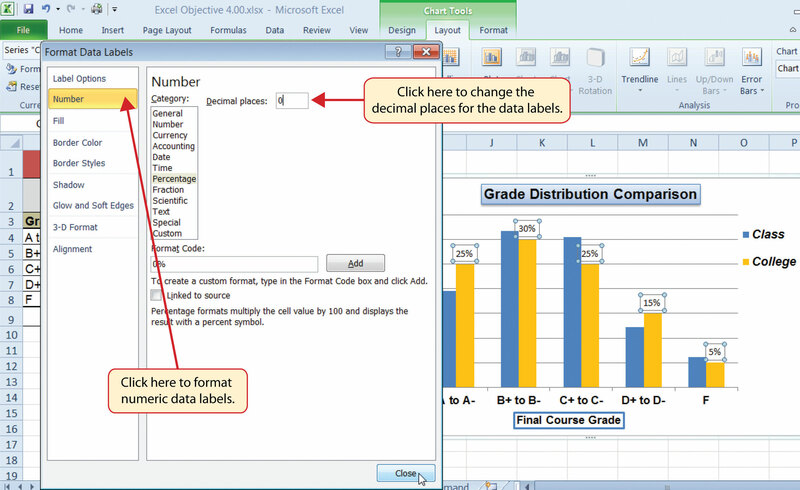 Format the data labels with an Arial font style, bold, and font size of 14 points. Notice that the mortgage and tax categories make up over 50% of total expenses. 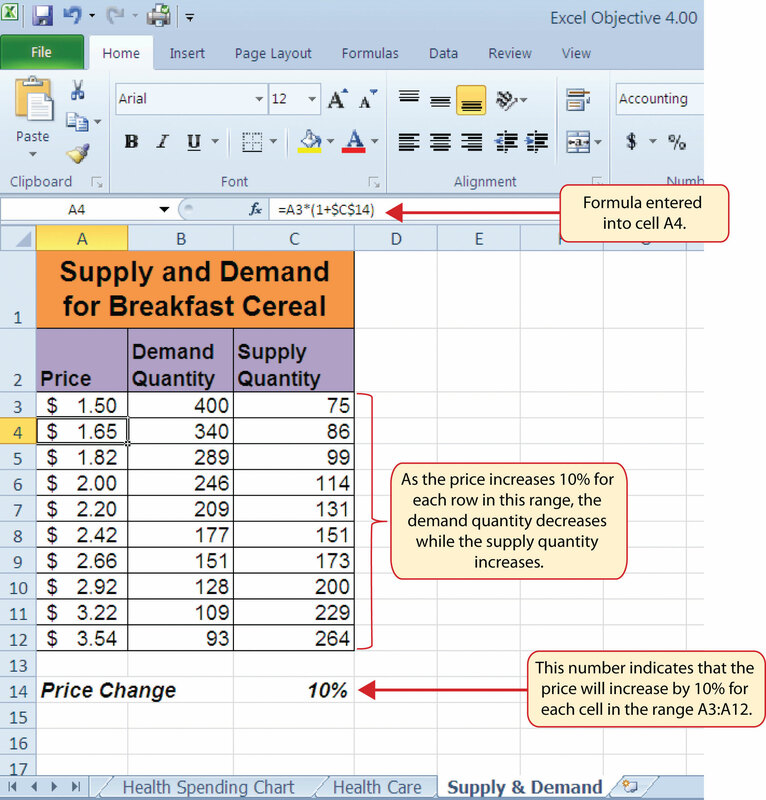 Enter a formula into cell D4 on the Savings worksheet. Your formula should add to the savings balance in cell D2 the result of subtracting the spending value in cell C4 from the net income value in cell B4. Enter a formula into cell D5 on the Savings worksheet. Your formula should add to the output in cell D4 the result of subtracting the spending value in cell C5 from the net income value in cell B5. Copy this formula and paste it into the range D6:D15 using the Paste Formulas command. 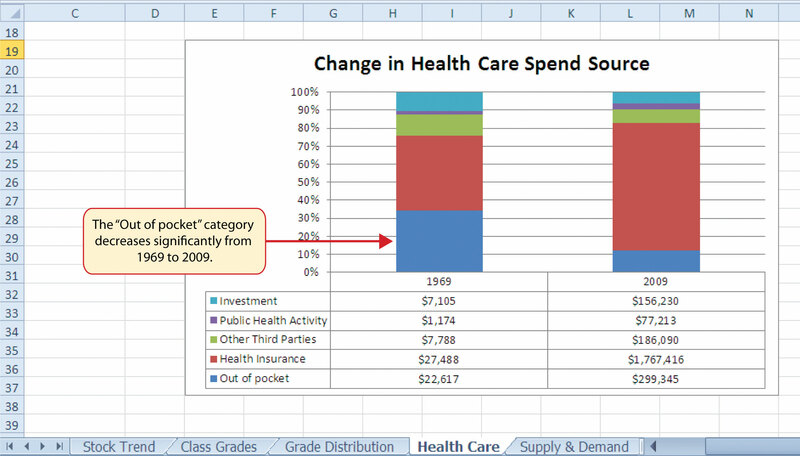 Create a line chart using the data in the Savings worksheet. The chart should show the months in the range A4:A15 along the X axis. The Y axis should show the dollar amounts in the range B4:D15. There should be three data series displayed on the chart: Net Income, Spending, and Savings. Use the Line with Markers format option. Move the chart so the upper left corner is in the center of cell F3. Resize the chart so the left side is locked to the left side of Column F, the right side is locked to the right side of Column O, the top is locked to the top of Row 3, and the bottom is locked to the bottom of Row 18. Add a chart title above the plot area that reads Savings Analysis. Format the title with the Subtle Effect - Red, Accent 2 preset shape style. Then change the font style to Arial, bold, and italics. Add a title to the Y axis that reads After Tax Dollars. Use the Rotated Title alignment option. Format the title with the Subtle Effect - Red, Accent 2 preset shape style. Then, change the font style to Arial and change the font size to 12 points. Move the title if needed so it is on the far left of the chart area and centered along the Y axis. Format the X and Y axes by changing the font style to Arial, making the font bold, and changing the font size to 12 points. Change the scale of the Y axis so the minimum value is set to −500. Move the legend up so it is aligned with the $4,500 line of the plot area. Expand the width of the legend so it extends to the far right side of the chart area. Then format the legend by changing the font style to Arial and making the font bold. 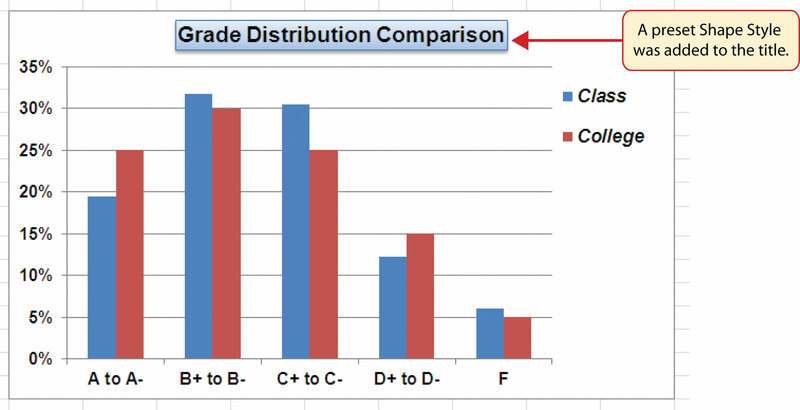 Change the color of the chart area to White, Background 1, Darker 15%, which is a shade of gray. Add an annotation that begins approximately one inch above the Dec label on the X axis. The annotation should extend approximately one and one-quarter inches wide and approximately one-quarter inch in height. The annotation should read Debt Incurred. Format the annotation by changing the font style to Arial, bold, italics, and font size of 12 points. Save the workbook by adding your name in front of the current workbook name (i.e., “your name Chapter 4 CiP Exercise 2”). The purpose of this exercise is to analyze a worksheet to determine if there are any integrity flaws. 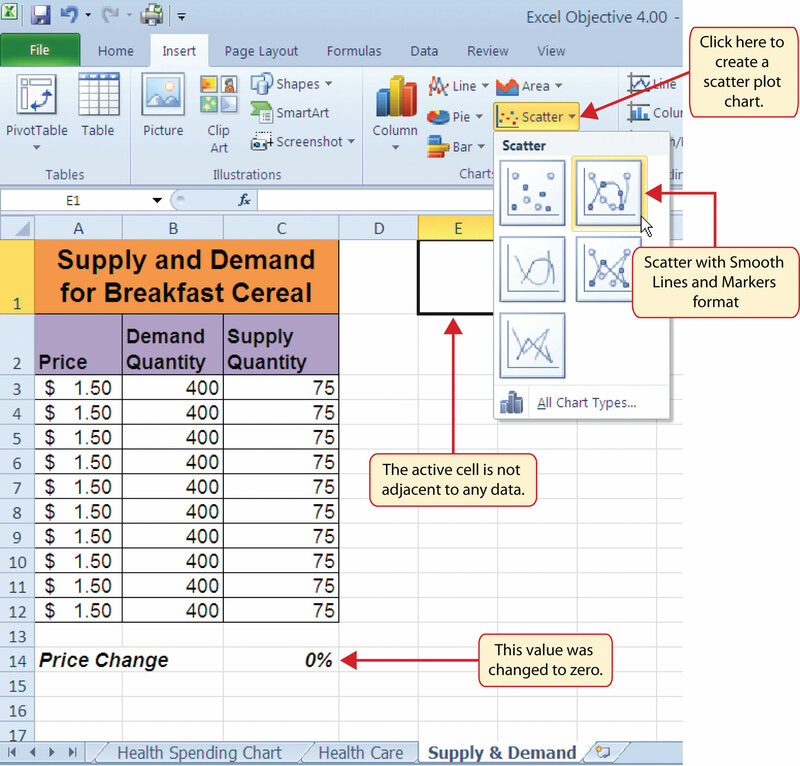 Read the following scenario, then open the Excel workbook related to this exercise. You will find a worksheet in the workbook named AnswerSheet. This worksheet is to be used for any written responses required for this exercise. I put a chart together to compare the earnings for the two companies. There is really nothing to look at. Big Company’s profits are so much larger than those for the Goode Company. Based on this chart, I don’t see how we would advise our clients to invest in the Goode Company. We should probably stick with the Big Company. Just so you know, the profit numbers on the chart are in thousands. Otherwise, it is a pretty straightforward column chart. I put the profits the companies earned for each quarter on the Y axis and the quarters are shown on the X axis. How many points of data is the analyst using on the chart? 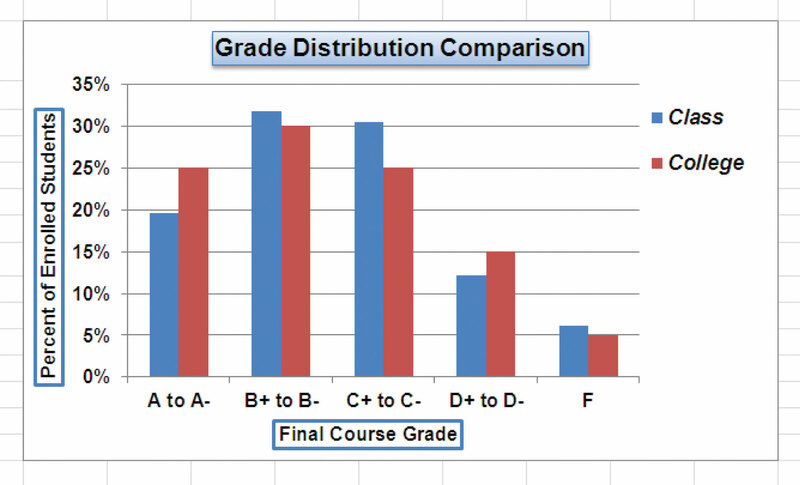 Does it make sense to use a column chart for this analysis? If not, what would be a better choice? Place your answer in the AnswerSheet worksheet. Look at the profit values for the two companies. Does it make sense to compare these values? If not, explain why and what alternatives you could pursue. Place your answer in the AnswerSheet worksheet. The analyst mentioned that the profit numbers are in terms of thousands. Would this be apparent by looking at the chart? If not, why? Place your answer in the AnswerSheet worksheet. Looking at the X axis of the column chart, you will see that the quarters keep repeating 1 through 4 for each year in Column A. Can anything be done to show the year that each set of four quarters represents? Place your answer in the AnswerSheet worksheet. 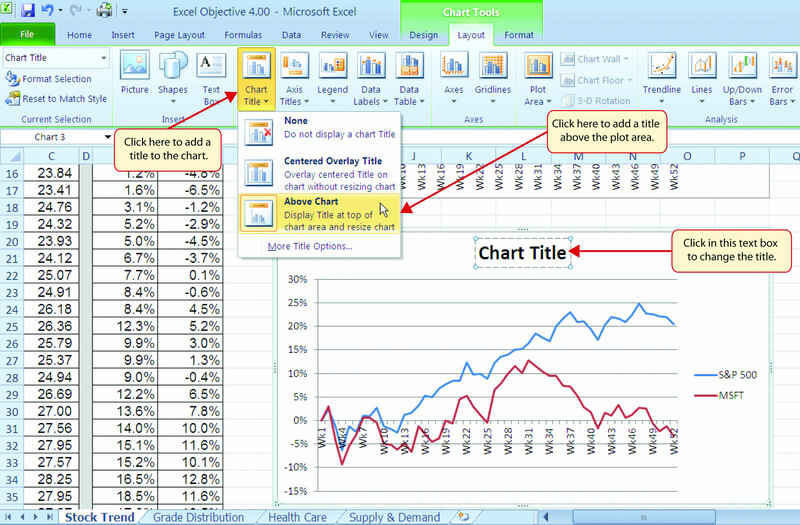 Move the chart created by the analyst to a separate chart sheet and label the sheet tab Analyst’s Chart. Make any necessary modifications to the Profit Analysis worksheet to create a chart that presents an appropriate comparison between the Big Company and the Goode Company. Create a new chart comparing the profits of the Big Company and the Goode Company. Pay careful attention to formatting details. Do you agree with the analyst’s conclusion that the firm should advise clients to invest in the Big Company over the Goode Company? Place your answer in the AnswerSheet worksheet. Columns B and C in the Hotel Costs worksheet contain occupancy and cleaning cost data for 12 months. Create a scatter chart that shows just the plot points (Scatter with only Markers) for the occupancy and cleaning costs for each month on this worksheet. The chart should be embedded in the Hotel Costs worksheet and should include the appropriate formatting techniques covered in this chapter. Adjust the scale of the X and Y axes so the minimum value is 2000. Add a linear trendline to the chart and show the equation. Use the trendline equation to enter a formula in cell C19 that calculates the estimated cleaning costs based on the occupancy level that is typed into cell C18. The chart should show which components are increasing or decreasing from year 1 to year 2. In addition, the dollar value for each component should appear on the chart for each year. The total quality control costs for each year should be specified on the chart. The chart should appear in a separate chart sheet. You should include appropriate formatting techniques covered in this chapter. Answer the following questions by executing the skills on the starter file required for this test. Answer each question in the order in which it appears. If you do not know the answer, skip to the next question. Open the starter file listed above before you begin this test. 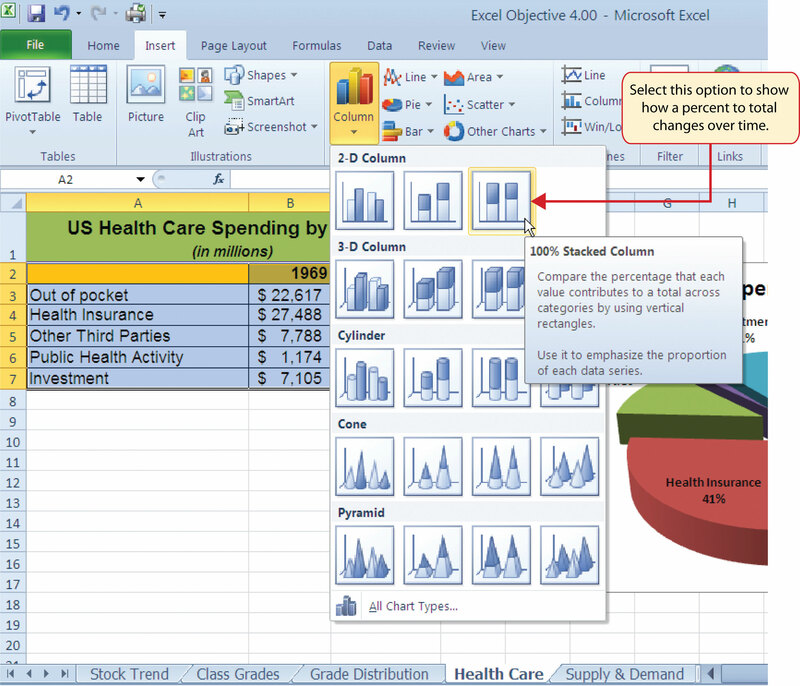 Create a pie chart using the data in the Market Share worksheet. The pie chart should show the percent of total for only the year 2000. Use the Exploded Pie in 3-D format. Change the chart title to the following: Market Share for the Year 2000. Add the Category Name and Percentage data labels to the outside end of each section of the pie chart. Bold the data labels and change the font style to Arial. Create a 100% stacked column chart using the data in the Market Share worksheet. 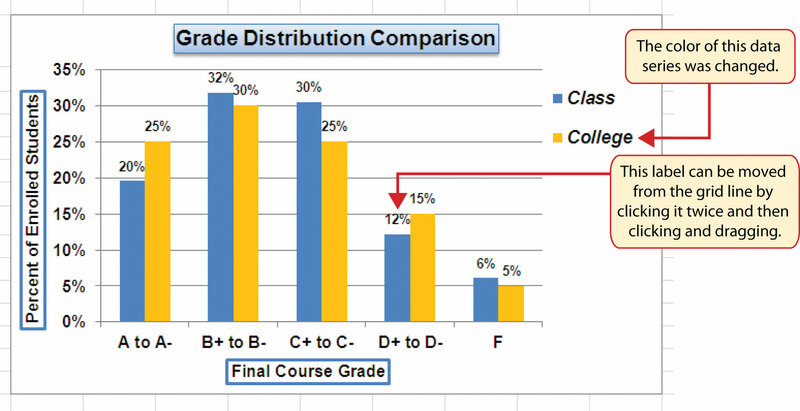 The stacked column chart should show the percentages 0% to 100% along the Y axis. The X axis should show stacks for the year 2000 and 2010. There should only be two stacks, or columns, in the plot area showing the percent of total for each company. Move the 100% stacked column chart to a separate chart sheet. The tab name for the chart sheet should read Market Share Chart. Remove the legend on the stacked column chart and add a data table with legend keys below the X axis. Add a title above the chart that reads 10-Year Change in Market Share. Format the chart title using the Subtle Effect - Red, Accent 2 preset shape style. Change the font style to Arial and the font size to 20 points. Add a Y axis title that reads Market Share. Use the Rotated Title alignment. Format the Y axis title using the Subtle Effect - Red, Accent 2 preset shape style. Change the font style to Arial and the font size to 16 points. Format the X and Y axes by changing the font style to Arial, making the font bold, and changing the font size to 14 points. 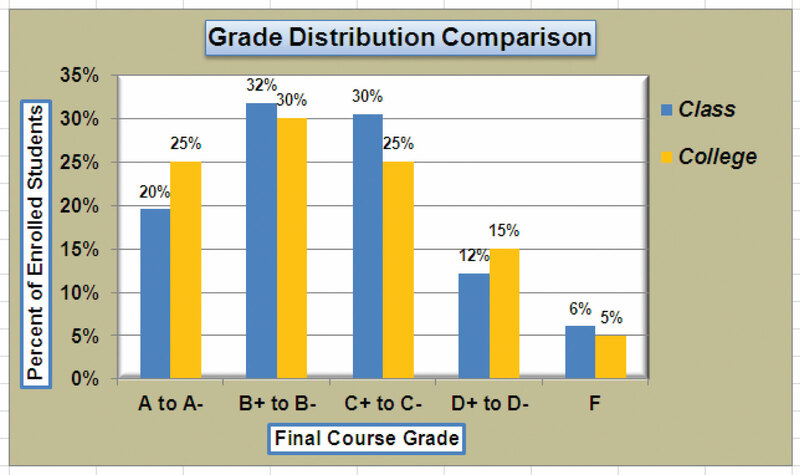 Change the fill color of the chart area to Tan, Background 2, Darker 10%. Add series lines that connect each section of the two stacks in the plot area. Create a column chart showing just the Company Sales in the Sales Data worksheet. The chart should show the Company Sales in the range B3:B13 along the Y axis. The years in the range A3:A13 should appear on the X axis. Use the basic 2-D Clustered Column format. The series name should be Gross Sales. Move the column chart to a separate chart sheet. The tab name for the chart sheet should read Company Sales Chart. Remove the legend on the column chart. Then format the X and Y axes by changing the font style to Arial, making the font bold, and changing the font size to 16 points. Reduce the height of the plot area by approximately one inch. There should be about one inch of space between the bottom of the chart title and the top of the plot area. Add an annotation above the Y axis that reads Sales in Millions. Format the annotation with an Arial font style, bold font, italics font, and font size of 14 points. Change the color of the bars in the plot area to dark red. The Y axis should show the growth percentages for the company in the range C3:C13 and the growth percentages for the industry in the range E3:E13. The series name for the company growth percentages should be Company. The series name for the industry growth percentages should be Industry. The years in the range A3:A13 should appear on the X axis. Use the Line with Markers format. Resize the chart so the left side is locked to the left side of Column G, the right side is locked to the right side of Column P, the top is locked to the top of Row 2, and the bottom is locked to the bottom of Row 18. Adjust the scale of the Y axis so the maximum value is set to .20. Format the values on the Y axis so there are zero decimal places. Save the workbook by adding your name in front of the current workbook name (i.e., “your name Chapter 4 Skills Test”).